Tension is the flavour of the month in online gaming. It’s the main ingredient in the two biggest multiplayer games in the world – PlayerUnknown’s Battlegrounds and Fortnite. A casual observer might remark that you spend 90 percent of your time in both of those games wandering around a large and seemingly empty map. But you’re playing for that 10 percent of sudden and breathless action, which can come anywhere at any time, in many different forms. It’s a formula that can spin literal billions if the developer in question can get it right. Sadly, it appears few can. A whole bunch of studios have driven themselves into the ground trying to mimic the success of PUBG and Fortnite, hastily cobbling together a Battle Royale to launch on Early Access, then looking shocked when their half-baked PUBG rip-off gets less attention than a Gary Glitter comeback tour. The failure of Radical Heights killed off Cliff Bleszkinski’s Boss Key Productions, The Culling 2 has done so badly that its developer’s future is under threat, and things aren’t looking good for Fear the Wolves developer Vostok Games either. Yet while every other studio digs its own grave as it prospects for that elusive Battle Royale gold, Crytek has apparently rescued itself by looking at current trends and spinning them into something genuinely different. 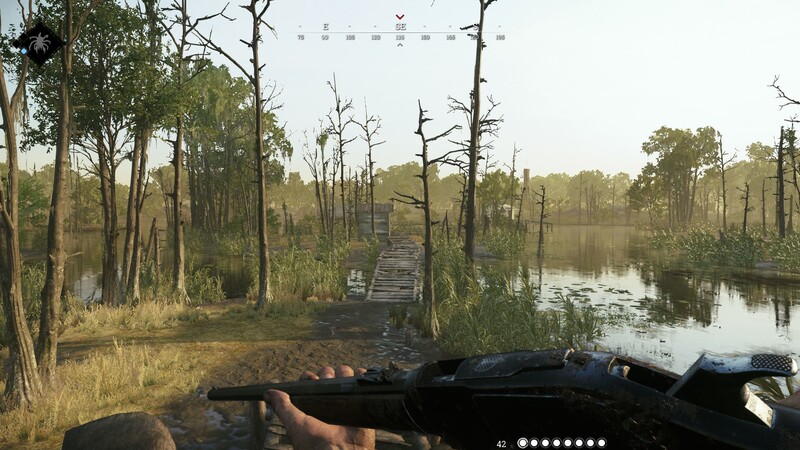 Enter Hunt: Showdown, a multiplayer shooter that blends cooperative and competitive play as teams of hunter attempt to locate and destroy a monster in the sweltering Bayou of Louisiana. Playable either solo or in teams of two (which is the ideal way to play the game) each match takes place in a large-ish 10km by 10km map, where dilapidated churchyards and abandoned canneries are separated by glistening expanses of swamp. Each player or team must explore this environment, gathering a series of “clues” that narrow down the location of the monster. Once you gather three clues, the monster’s location is pinpointed on the map. If you follow Showdown’s structure (which is optional, as I’ll explain later), the next stage of the match is to track down and battle the monster. 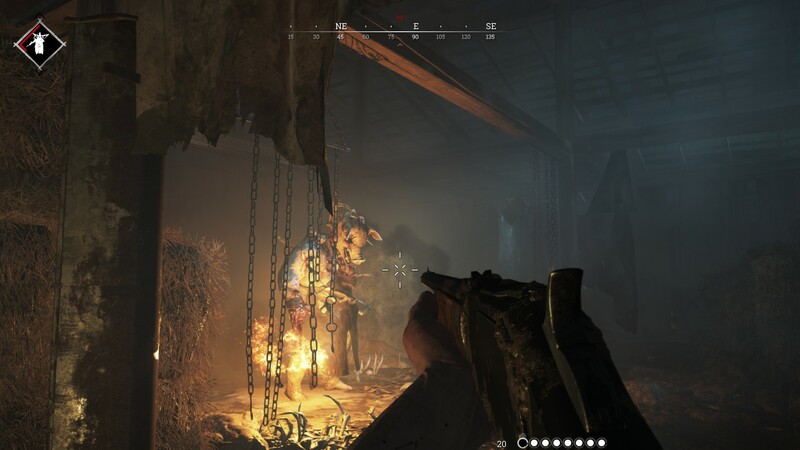 Currently there are two available monsters in Hunt: Showdown. One is the Butcher, a hulking Texas Chain Saw Massacre-like fellow who sports a meat cleaver and a health bar longer than the Mississippi. The other is the Spider, which…well…it’s a really big spider that does lots of nasty spidery things, like crawling really fast on the ceiling and spitting blinding poison at you. In most games, killing this monster would be the climax of the experience. But in Hunt it’s only the halfway point. If you emerge victorious, you must then Banish the monster’s soul from the world. This is the point at which the Hunt ends and the Showdown begins, because once you begin the banishment ritual, other Hunters are alerted to the monster’s location, and by proxy, yours. They want the bounty for the monster’s death just as much as you do, and just because they didn’t do the job doesn’t mean they won’t step over your corpse to collect it. Hence, you have to defend the location from other hunters until the banishing is complete, before making a final run to an extraction point with the bounty intact. That’s the primary route to victory in Hunt: Showdown, but there’s nothing in the rules that says you have to follow that path. 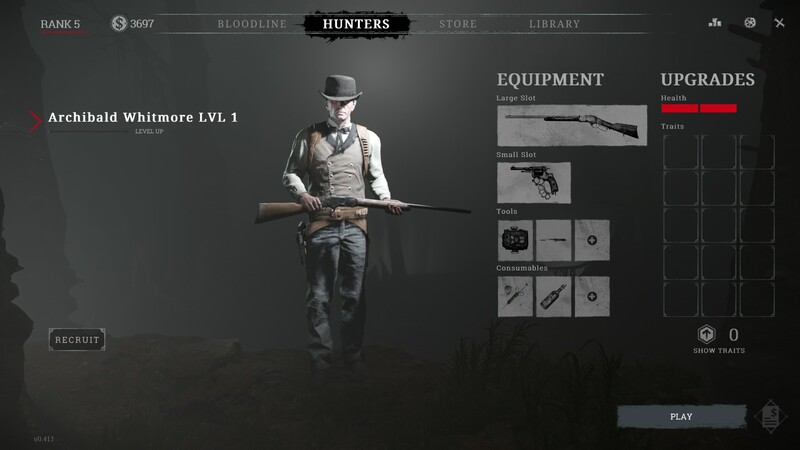 Showdown is an open-ended multiplayer game, which means it’s perfectly viable to go hunting other hunters, or wait for another hunter to kill the monster before you swoop in to steal his prize. You could even spend the entire match lurking at an exit point in the hope that a Hunter will bring the bounty to you, then ambush them at the last minute and claim the prize as your own. 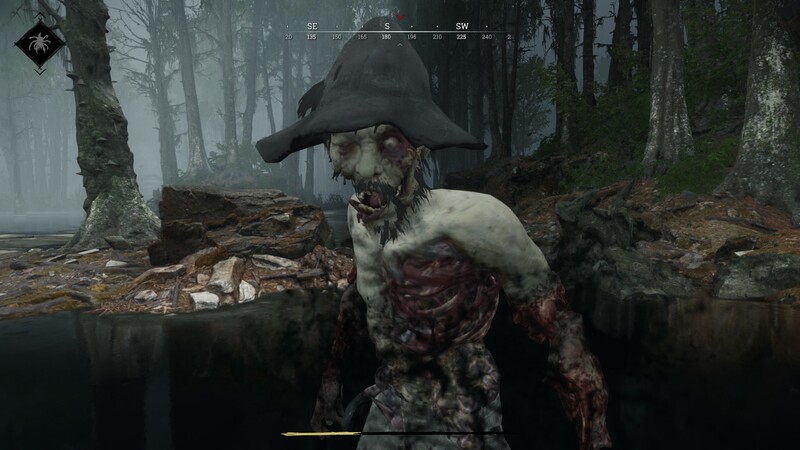 This may make it sound like Hunt: Showdown is a campers’ paradise. But the structure is such that, although squatting on an exit might work, there’s no guarantee it will. First off, Showdown doesn’t give any indication of where other hunters might be, or even how many other hunters are in the same match as you. The only hints offered by the game itself is a flash of lightning in the sky to indicate that another player has found a clue. Moreover, even if you decide not to go looking for the monster, that doesn’t mean you’ll have an easy time of it. The game world is swarming with other undead, ranging from regular ol’ zombies to hulking brutes. Most of these enemies are easy to kill from range, but gunshots will echo across the landscape, potentially attracting other hunters if they decide to investigate. Hence, it’s best to kill zombies with a melee weapon, but this leaves you more vulnerable to attack, especially if you attract several at once. This is perilously easy to do, because the world is littered with noise-making hazards, such as crushed glass on the floor or penned dogs that bark if you get too close. The result of all this is that a round of Hunt: Showdown is rarely predictable. You’re constantly on-edge, as one mistake could quickly spell the end of your game. 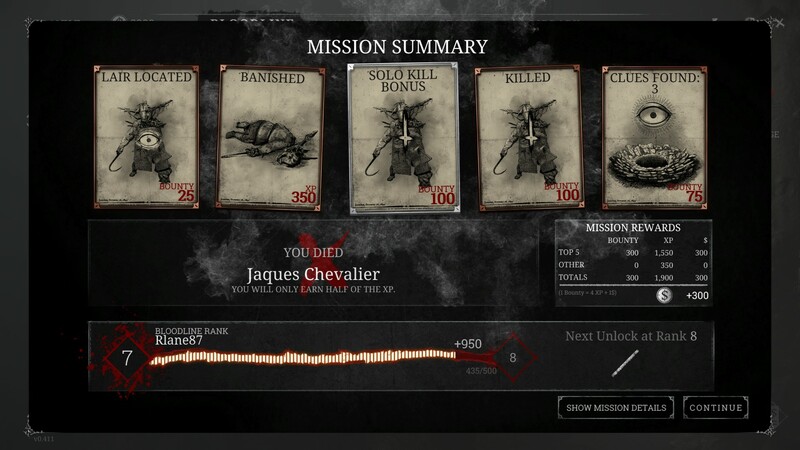 In one match I recently played, I tracked the monster to a barn, killing both it and another hunter who tried to ambush me mid-battle. I completed the ritual, then emerged from the area only to find it had been surrounded by several hunters. 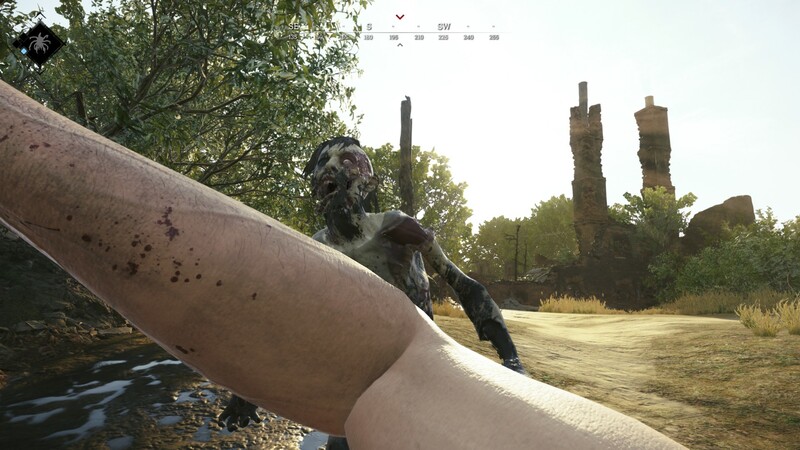 I evaded their gunshots and managed to escape, but in doing so I ended up in the middle of a swamp, where I was immediately set upon by the new 'water-devil' monster, who swiftly ended my Hunt. As well as being a very different and somewhat more interesting experience than the battle royale games, Showdown is also in pretty good shape for an Early Access title. The environment looks great, and those 19th century weapons have a real sense of weight and power. Also, don’t mind the fuzzy looking textures on close objects in the images; I recently reinstalled the game and forgot to alter the default settings before jumping in. The decision to set the game before the advent of machine guns also makes gunfights tense and cagey affairs. Most weapons have low rates of fire and relatively slow reloads, so it’s wise to think about how you’re going to approach a combat scenario, and it means that players with slower reaction times aren’t going to be completely outclassed. Crytek has also clearly worked hard to improve the flaws evident on launch. Matchmaking is now much more reliable, although the game still has a tendency to throw you in with Hunters with a much higher level than you. The game has also seen a regular influx of new content, including the water-devil monster that I mentioned previously. 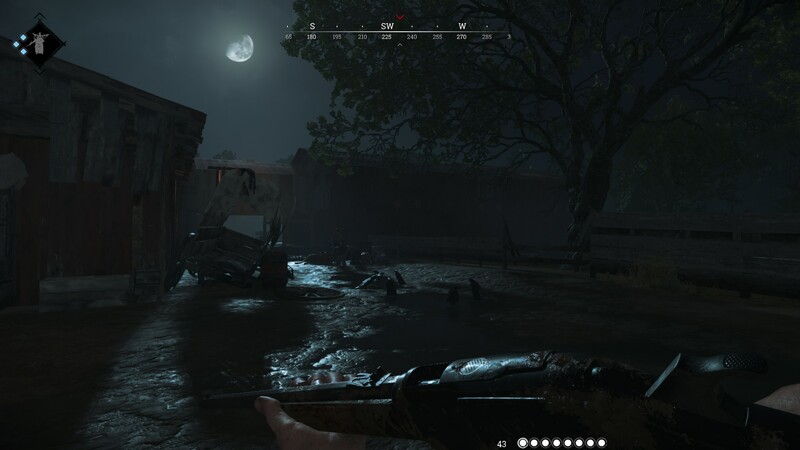 If you’re a fan of multiplayer shooters but have been left cold by the battle royale brigade, Hunt: Showdown offers a similarly tense experience but in a much more interesting format.